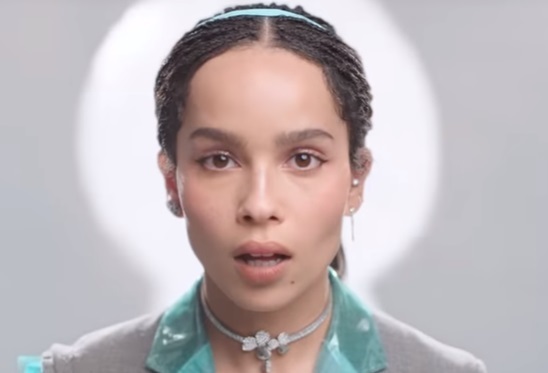 Zoe Kravitz stars in Tiffany & Co.’s “Believe in Dreams” holiday campaign, which showcases the jewelry company’s holiday collection. The campaign film, directed by Mark Romanek, features the 29-year-old actress as an employee working at the brand’s Fifth Avenue flagship store, who is transported into a Tiffany Blue dreamscape after she turns off the lights in the store. Scored by Aerosmith’s classic “Dream On,” the commercial also features Chinese model Xiao Wen Ju, red-haired English supermodel and singer-songwriter Karen Elson, and 70-year-old Canadian-South African model Maye Musk as colorful characters who all join Zoe at a tea party hosted by supermodel Naomi Campbell. Throughout the video, designs from Tiffany’s Paper Flowers, Hardwear, Tiffany T, Return to Tiffany and Tiffany Keys collections, as well as pastries from the jeweler’s Blue Box Café are shown. To mark the campaign debut, on November 16, Tiffany has mounted a craftsmanship workshop within its Fifth Avenue flagship featuring jewelers, stone-setters and engravers.